Turtles return to the exact geographical point where they were born every year to give birth. Beach lounge chairs, tables and even sand castles obstruct the path of the turtles making them unable to arrive at their exact intended destination, causing them to turn around and return to the sea without giving birth. The birthing mothers will not nest if they don’t feel safe enough. Keep a respectful and quite distance of at least 10m and in small groups no more than 5 people so as not to scare off the mothers. Once mothers have successfully nested, it is important to protect the precious eggs from predators or poachers. The best thing to do is to put up a make-shift fence or even just mark the area with something so indicating that it is a turtle nest with the date of when they were laid so that we can calculate roughly 2 months from that date when the eggs will hatch. Pick up and trash, avoid beach parties and fireworks etc. Any behavior which is not in keeping with Mother Nature would disturb this natural event or could even harm the turtles. Firstly, because it is potentially dangerous to your health as the baby turtles are covered in a layer of salmonella which can be passed onto humans if they pick them up or touch the eggs. Secondly, the first moments of the hatching’s lives are essential for imprinting the geographical location of their birth as this is how they remember where to come back to year after year for the rest of their lives. The hatching turtles are guided to the safety of the sea by the moonlight. Torches, flashes or beach lights distract them and can lead them off-course and to a certain ill-fate. If you see a turtle going off course or in danger, contact your local Turtle Protection Organization or intervene if need be. Want to see the turtles for yourself? 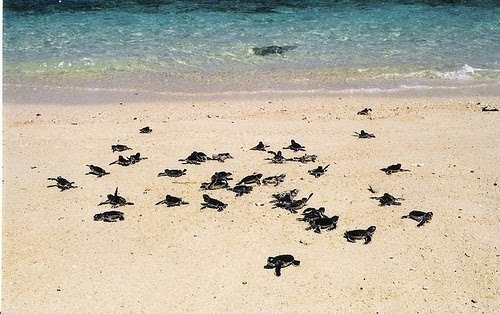 Come to a Life Source adventure on the turtle-filled beaches of Tulum.